An injury that causes paralysis can be devastating for the patient as well as his family. A paraplegic injury occurs when the spinal cord is damaged, causing a patient to lose all use of his legs. According to the Catastrophic Injury Resource Center, paraplegic patients require specific types of care to help reduce the risk of infection as well as improve the quality of life. Understanding the needs of a paraplegic can help you provide the best level of care necessary for the health and happiness of the patient. Choose a well-functioning and high-quality wheelchair. 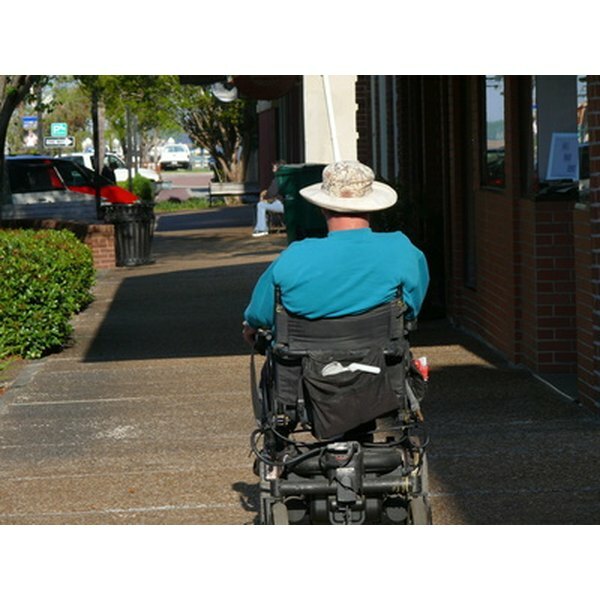 A wheelchair is an essential item for a paraplegic, because it will enable him to get around more easily as well as help him regain some of his independence. Involve the paraplegic in the selection process so he can try a few wheelchairs and choose the one that works best for him, suggest David B. Jacoby and R.M. Youngson, authors of "Encyclopedia of Family Health." Modify your home to accommodate the patient. Rearrange furniture to allow a wheelchair to pass through and remove any pieces that cause barriers for movement. Set up a bedroom on the ground floor so the patient can retreat to her own space when needed. Install bars in the bathroom and shower to help prevent falls. Move the paraplegic patient so he does not develop sores from inactivity. Sores can develop on the back and on the back of the legs, due to sitting or being in a prone position most of the time. Help the patient roll onto his side or stomach for longer periods of time to prevent sores from developing, recommends Robert Bruce Salter, author of "Textbook of Disorders and Injuries of the Musculoskeletal System." Inspect the paraplegic patient's catheter on a regular basis to ensure that it is sanitary. Urinary tract infections can be serious for paraplegic patients, notes Salter, and taking proper care of the catheter can help prevent them. Many doctors recommend teaching the patient how to take proper care of the catheter on his own. Provide time for the patient to pursue personal interests. Quality of life is an important aspect of patient care. Encourage the patient to visit the local library to check out books and movies. Take the patient to museum openings or art shows. If the patient has use of his arms, provide the materials for him to engage in his hobbies. Invite family and friends to visit often to help keep the patient's spirits up and to encourage the maintenance of important relationships. Keep an extra wheelchair on hand because malfunctions are quite common, report Jacoby and Youngson. Keep the patient's doctor involved in all aspects of care to ensure that the paraplegic remains as healthy as possible.